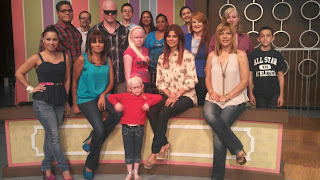 Ivette Vasquez, President of the HPS Network Puerto Rico, was joined by 14 other HPSers and family on the television program Entre Nosotras on WAPA TV 4 in San Juan. The group spoke about Hermansky-Pudlak Syndrome and the Eighth Annual HPS Puerto Rico Conference. A special hit with the interviewer was little Daneishka m Gonzalez Rodriguez. She sat on the host’s lap for almost the entire interview and was an awesome ambassador for HPS!